Be a super hero–protect orangutans! Like getting all the latest news and recipes on Greenmomster? Be sure to“Like” us on Facebook! Here’s a tasty recipe for cool fall nights – we’re planning to have it on Halloween night! Not a quick recipe, but the end-result is filling and a crowd pleaser. I adapted this recipe from one found in the November 2013 issue of Cooking Light. For National Reptile Awareness Day! My students were asking a lot of questions this week about reptiles and their brain power, so I’m reposting this article about the Komodo dragon (Varanus komodoensis). Found in the wild on a few volcanic islands in Indonesia, this largest of all reptiles (with large individuals weighing over 150 lbs) will eat almost any type of meat. It is endangered (population is estimated at 3,000 to 5,000 individuals) because of its limited range, lack of egg-laying females, human encroachment, and natural disasters. Since it’s a top predator in its habitat, the Komodo dragon plays an important role in keeping the ecosystem in balance. In my previous post about the state of birds in the world, the video interview mentioned that we’ve already lost 10 bird species in Hawaii to extinction – a sad report indeed. So I figured I’d share with you a teeny, tiny, thin silver lining on climate change and species survival. In September, the Washington Post reported on a study by researchers at Dartmouth College and UVA. These researchers found that some species of lizard seem able to adapt and function at higher temperatures. Previously, researchers didn’t think tiny lizards could adapt their behavior so quickly to changes in temperature, but they found evidence that little brown anolis in the Bahamas can adjust. Low Methane Friday (aka meat-free Friday)! Do your part – cook something tasty! And be sure to “Like” greenmomster on Facebook! 2) Heat oil in a large frying pan over medium heat. Add onions and cook until browned and soft (stir once in a while), about 30 minutes. 3) In a bowl, whisk together eggs, milk, mustard, salt, and nutmeg. Remove pie crust from freezer, and sprinkle cheese evenly on bottom of crust. Spread onions on top of the cheese. Pour egg mixture over cheese and onions. 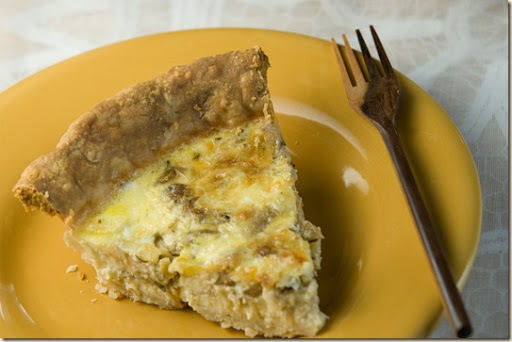 Bake quiche for 45 minutes or until eggs are set. TBT–Carrion. It’s not just for breakfast anymore. Since this week’s earlier post was about birds, I figured I’d use this past post for TBT AND Halloween! Enjoy! Since September 1, 2012 (and Sept 6, 2014), was International Vulture Awareness Day, this week’s endangered species is a group of animals – the vulture! While some species populations, like the King Vulture (Sarcoramphus papa) pictured here, are doing well, other species populations, like the California Condor (Gymnogyps californianus) and theAndean Condor (Vultur gryphus) are less secure. These massive birds are nature’s waste management experts, cleaning areas of dead and rotting carcasses. Their bodies are specially adapted for this task with their bare heads and strong beaks. California condors are one of the best known survival stories in conservation biology. These spectacular birds, with wingspans of up to 10 feet, can soar as high as 15,000 feet! In the 1970s, the population dwindled to only 2 or 3 dozen birds, and then dropped to only 10 birds in 1987. Since the birds don’t reach sexual maturity until 6 to 8 years of age, and then they breed slowly, recovery of the species was difficult at best. Through the persistent work of endangered species biologists, reintroduction of the birds began in 1992 and now 127 individuals live in the wild. The Andean condor population is doing better than its California cousin, with a few thousand individuals found in the wild. Like the California condor, it’s a slow breeder and a vital link in the food chain (info from National Geographic). It’s probably the vulture with which you’re most familiar, because it’s the one that looks like it has a white, fur collar around its neck. 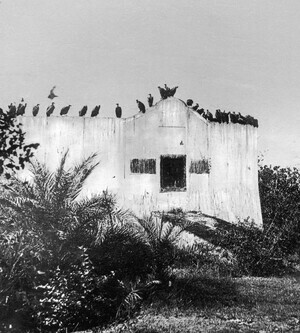 So get out there and celebrate Vulture Awareness Day – without scavengers our world would be A LOT messier! One of the species of concern is the cerulean warbler, which is a small migrant that lives and breeds in Eastern forests and then heads to the tropics for the winter. I’ve been reading an interesting book about these little birds, Cerulean Blues, by Katie Fallon. Part bird history, part memoir, the book is an interesting story of one woman’s adventure searching for these elusive little birds. It turns out that the energy we use (coal) actually has an impact on the survival of this species. In addition to the State of the Birds Report, the Audubon Society recently issued its Birds and Climate Change Report, 314 Species on the Brink. The accompanying website allows you to see how the specific species in your area are affected by climate change – this is really a cool tool for educating yourself about your local area! Keep your cat indoors. Cats kill as many as 2.4 billion birds per year in the U.S. Additionally, the presence of a cat can affect breeding success for birds. Plant native plants. They encourage growth of insect populations and provide fruit for bird species. Limit, or better yet eliminate, pesticides in your yard. Provide freshwater through bird baths, ponds, and fountains. After you’ve created your bird-friendly habitat, get yourself a pair of binoculars and a bird ID book and enjoy your feathered visitors! Mix together the olive oil and spices. Pour over the cauliflower and mix well. Roast the seasoned cauliflower for about 45 minutes. Boil the cauliflower in the vegetable broth until the cauliflower is soft. Place 1/2 of the cauliflower mixture in a blender and puree. Mix the soup back together and blend the remaining 1/2. Serve topped with parmesan cheese and tasty bread! October 1 was World Vegetarian Day, so let’s celebrate with something a little international – Madras Pie! I adapted this recipe from one I found in the October 2014 issue of Family Circle magazine. Remember – to get the latest recipes and environmental news, be sure to “Like” greenmomster on Facebook. Boil potatoes until they’re soft enough to cut with a fork. Heat oil in a large pot. Fry Quorn in oil until light brown. Add in carrots, parsnips, ginger, salt, cumin, coriander, cinnamon, turmeric, cayenne, 1/2 cup water, and frozen peas. Cover and cook until veggies are softened. Mash the potatoes with milk (you might need a little more to make them smooth) and butter. Place veggie mixture in a baking pan and top with potatoes. Bake uncovered for 20-25 minutes.